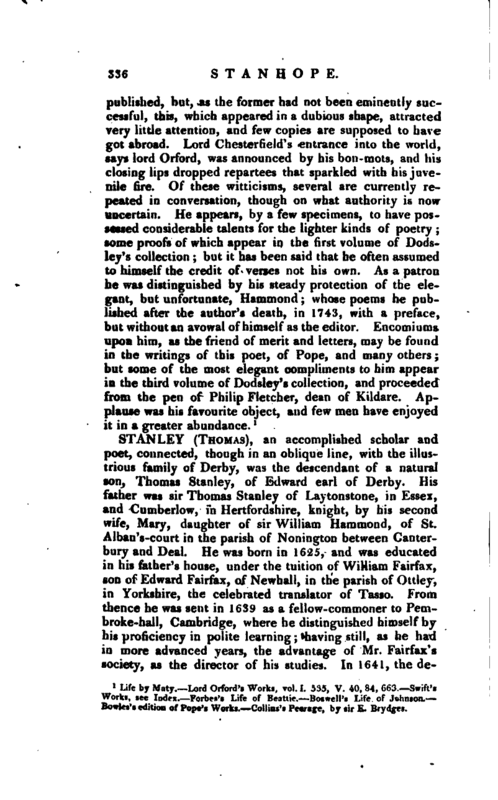 , an accomplished scholar and poet, connected, though in an oblique line, with the illustrious family of Derby, was the descendant of a natural son, Thomas Stanley, of Edward earl of Derby. His father was sir Thomas Stanley of Laytonstone, in Essex, and Cumberlow, in Hertfordshire, knight, by his second wife, Mary, daughter of sir William Hammond, of St. Alban’s-court in the parish of Nonington between Canterbury and Deal. He was born in 1625, and was educated in his father’s house, under the tuition of William Fairfax, son of Edward Fairfax, of Newhall, in the parish of Ottley, in Yorkshire, the celebrated translator of Tasso. From thence he was sent in 1639 as a fellow-commoner to Pembroke-hall, Cambridge, where he distinguished himself by his proficiency in polite learning; having still, as he had in more advanced years, the advantage of Mr. Fairfax’s society, as the director of his studies. In 1641, the | degree of M. A. was conferred on him per gratiam, along with prince Charles, George duke of Buckingham, and others of the nobility. Mr. Stanley died at his lodgings, in Suffolk-street, in the parish of St. Martin’s-in-the-Fields, April 12, 167S, and was buried in the church there. He married Dorothy daughter and co-heir of sir James Enyon, of Flower, in Northamptonshire, bart. 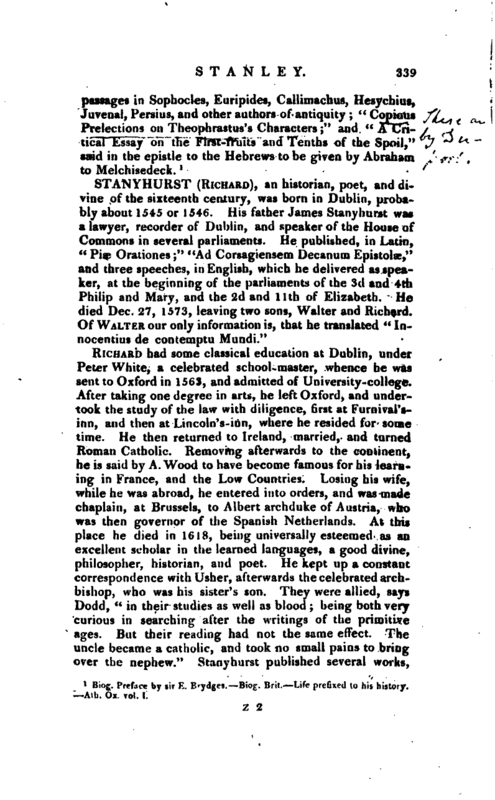 By this lady he had a son of both his own names, who was educated at Pembroke-hall, Cambridge, and, when very young (Aubrey says at fourteen), translated Ælian’s “Various Histories,” which he dedicated to his aunt, the lady Newton, wife of sir Henry Puckering Newton, knt. and bart. to whom his father had dedicated his jÆschylus. 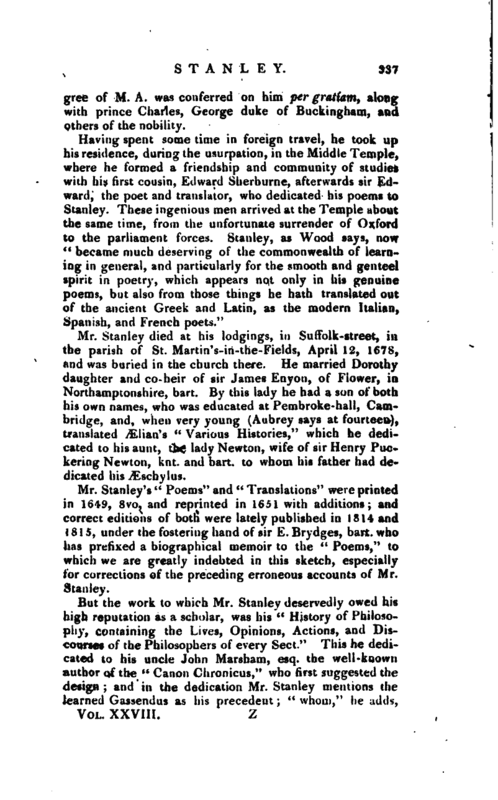 Mr, Stanley’s “Poems” and “Translations” were printed in 1649, 8vo, and reprinted in 1651 with additions; and correct editions of both were lately published in 1814 and 1815, under the fostering hand of sir E. Brydges, bart. who has prefixed a biographical memoir to the “Poems,” to which we are greatly indebted in this sketch, especially for corrections of the preceding erroneous accounts of Mr. Stanley. Biog. 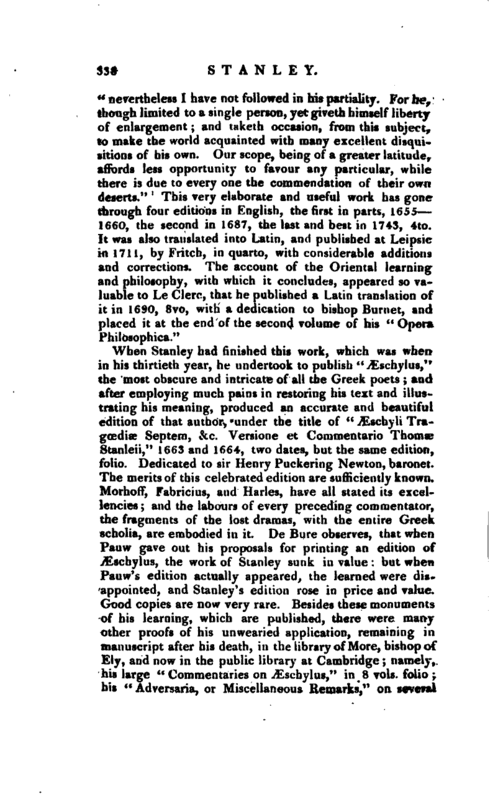 Preface by sir E. Brydges.—Biog. Brit.—Life prefixed to his history. —Ath. Ox. vol. I.